With June come weddings and with weddings come guests who also are often first time visitors to Martha’s Vineyard. 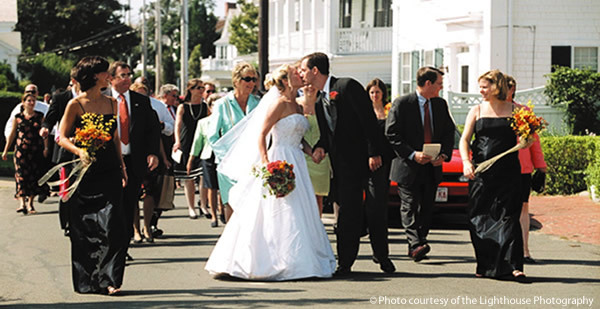 What follows is a wedding guest’s guide to the Island – from suggestions on getting here to taking full advantage of your possibly brief visit to the Island. Being under 100 square miles the Vineyard lends itself easily to doing and seeing a lot even if all you have is a small window of time. Come to celebrate, stay to explore and let yourself fall in love with this beautiful island! the last toasts are offered. Enjoy! Getting to Martha’s Vineyard is easy once you know what your options are. >Click here< for a complete description transportation offerings from a number of US cities to Martha’s Vineyard. Unless you fly, you will be arriving on Martha’s Vineyard by ferry, either in Oak Bluffs (seasonal) or Vineyard Haven (year-round). Only about 6 miles apart, each of these Martha’s Vineyard towns offers taxi and bus service adjacent to the terminal. The airport, located in Edgartown, is on the bus route and taxis are also available. Though wedding invitations usually include a list of convenient B&B’s, hotels and inns, to see additional listings >View All Accommodations<. Each of Martha’s Vineyard’s six towns offer restaurants and shops. The towns of Edgartown, Vineyard Haven and Oak Bluffs are larger and therefore the choices are more varied and the hours longer. Chilmark is the Island’s remaining ‘dry’ town. No alcoholic beverages of any kind are available for purchase; if you want to drink any alcoholic beverage at a restaurant, you need to BYOB – bring your own. Taxis and a comprehensive Martha’s Vineyard bus system make getting around easy. Parking convenient to most ferry terminals on Martha’s Vineyard is provided for those opting to leave cars on the mainland. See: Stroll the historic streets lined with 19th century whaling captains’ homes. Eat: Among The Flowers Cafe, Alchemy, The Atlantic and Detente are among the downtown restaurants offering outdoor seating. Check out the numerous tempting wine lists and small plates for sampling. Isola offers excellent wood-fired pizza, full bar and an outdoor courtyard to congregate with friends and family. Experience: The Farm Institute in Katama, a working/teaching farm. Visit the animals and purchase local produce & meats at the farm stand. Experience: Stop by Wind’s Up and rent a kayak for some peaceful, pre-party recreation. Eat: Do what the Martha’s Vineyard locals do, start the day with coffee and a muffin at 7A Foods behind Alley’s General Store, which has been welcoming folks to its front porch for over a hundred years. Experience: Farmers Market at the Grange Hall. The real thing with lots of local produce, home-baked snacks, and great ambiance. Check out the Artisans Fair at the same location, twice weekly in season. See: The view of the Elizabeth Islands from the Aquinnah Cliffs or, if the timing is right, the Gay Head Lighthouse. Eat: Home Port Restaurant…fresh seafood with a view. Experience: The sun setting over the waters to the west, a rare sight on the east coast of the US. The working fishing harbor of Menemsha offers your choice of front row seating on the pier or beach.